This article is about Fajardo (disambiguation). 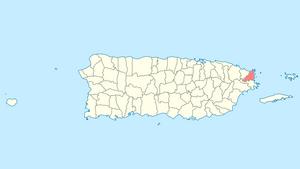 For other uses, see Fajardo, Puerto Rico (disambiguation). 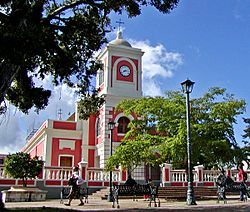 Nickname(s): "Los Cariduros", "La Metrópolis del Sol Naciente"
Fajardo (Spanish pronunciation: [faˈxaɾðo]) is a small city and municipality in Puerto Rico located in the east region of the island, bordering the Atlantic Ocean, north of Ceiba and east of Luquillo. 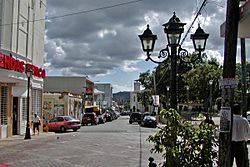 Fajardo is spread over 7 wards and Downtown Fajardo (commonly called by the locals "Fajardo Pueblo"), which serves as the administrative center of the city. 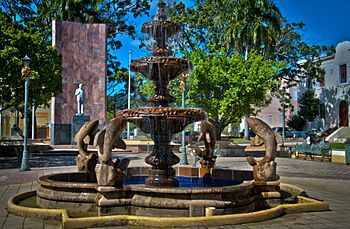 It is both a principal city of the Fajardo Metropolitan Statistical Area and the San Juan-Caguas-Fajardo Combined Statistical Area. 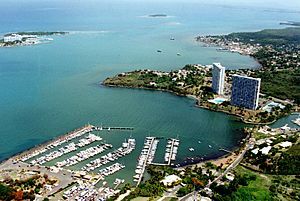 Fajardo is the hub of the majority of recreational boating in Puerto Rico and a popular launching port to Culebra, Vieques, and the American and British Virgin Islands. It is also the home to the largest Marina in the Caribbean, called Puerto del Rey. The town contains various hotels and inns. Fajardo, Puerto Rico Facts for Kids. Kiddle Encyclopedia.